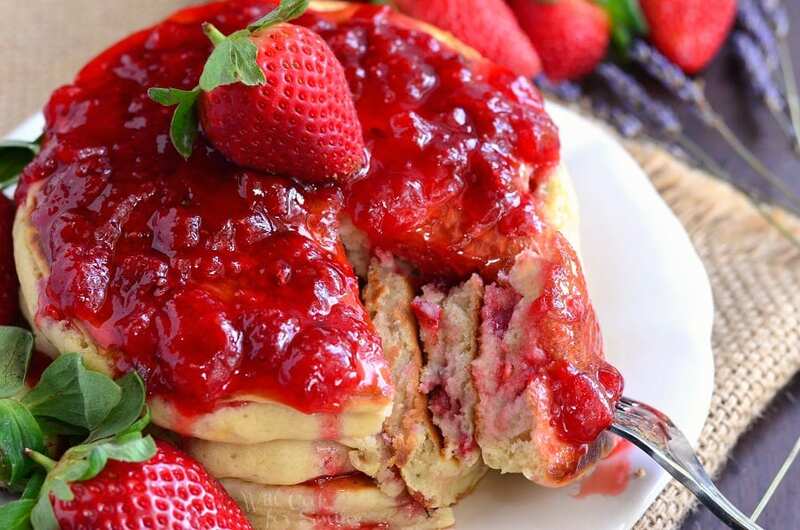 Beautiful breakfast with an amazing flavor and aroma. 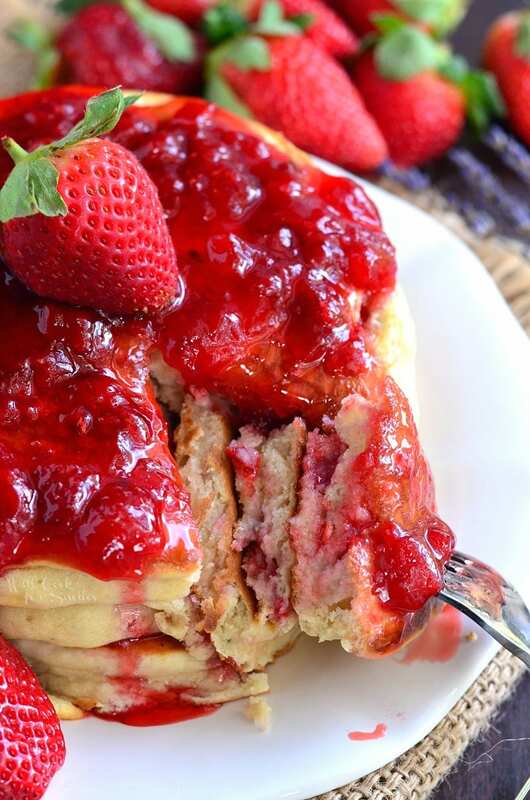 These pancakes are made with fresh strawberries and lavender inside and topped with a freshly made strawberry lavender topping. 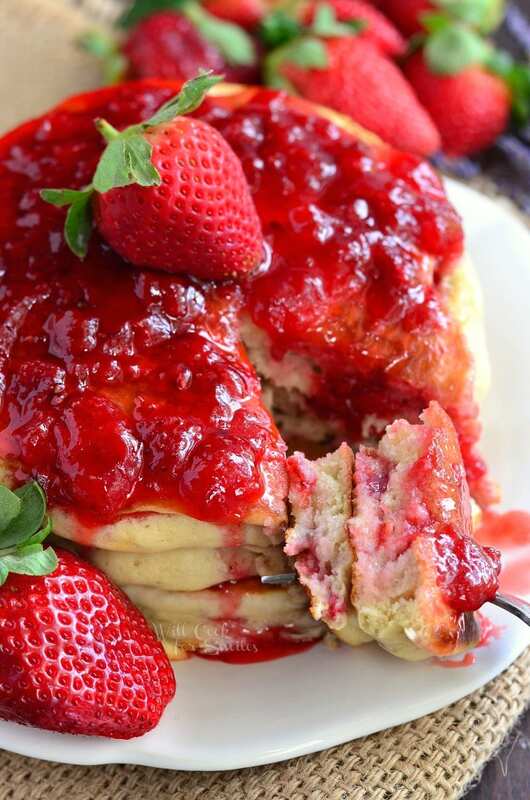 These Strawberry Lavender Pancakes are quite a treat to wake up to. The sweetest holiday of the year is coming soon and we need to be prepared with some of the sweetest recipes. I don’t necessarily mean recipes that are loaded with sugar, I’m talking about the recipe that have a sweet meaning. 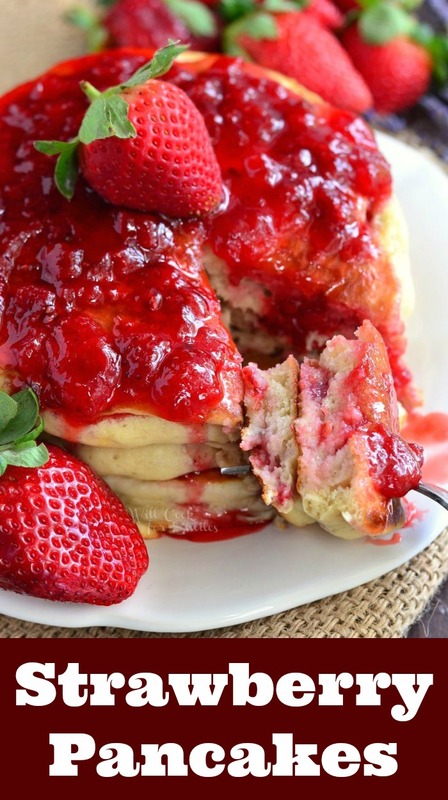 A good example of a sweet Valentine’s Day recipe are these Strawberry Lavender Pancakes. Just imagine the scent of sweet strawberries and lavender gently waking you up in the morning. 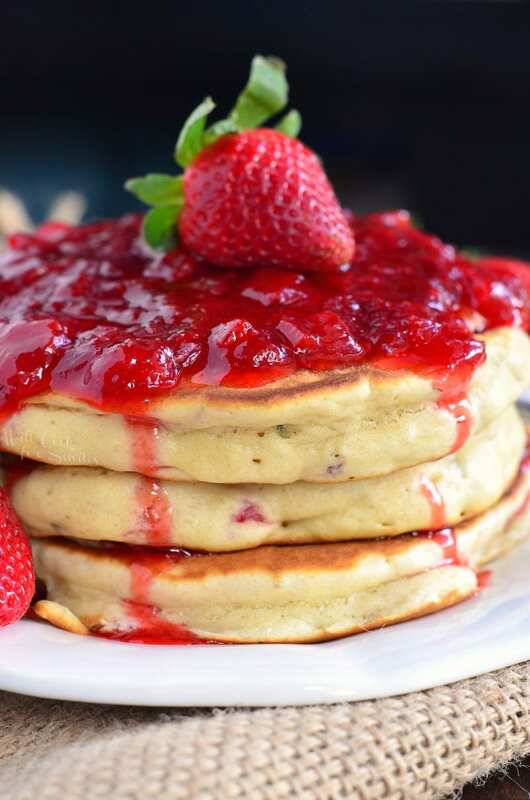 You open your eyes and there is a tray with a stack of freshly made, fluffy strawberry lavender pancakes that are topped with fresh strawberry lavender topping on the bed right next to you. Now, that is one beautiful and special breakfast in bed. Big bonus if there is a glass of orange juice and a rose on the tray as well. It would be a very special way to wake up your sweetheart on Valentine’s Day. If you’re not familiar with cooking and baking with lavender, I have a few tips for you. ~The main thing to remember is that lavender is very potent, a little bit of lavender is all you need. Try not to overdo it or it will overpower every other flavor in the dish. ~Lavender is not just for sweets, you can use it in savory dishes as well. It pairs well with berries, fruit and many herbs. ~Lavender is also great for flavoring many drinks and syrups. 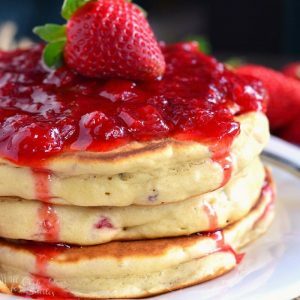 These pancakes are made with fresh strawberries and lavender inside and topped with a freshly made strawberry lavender topping. Preheat a sauce pot over medium heat. Add diced strawberries, water, and lemon juice. Let it cook for a couple of minutes and stir in sugar and vanilla. Cook over medium for about 10 minutes, stirring often. Add lavender and cook for a couple more minutes. Take off heat. Whisk together the wet pancake ingredients until combined. Wow, these pictures look incredible. Reading the recipe, I bet it is as delicious as it looks. I will definitely try them out tomorrow. Thank you!